Meherabad (Ahmednagar): So many theories have been advanced on the manifestation of Meher Baba and all these are based on what Meher Baba had said at various times. The basic theme running through these theories is that Avatar of the Age has not yet manifested and that it will take place in due course, probably over the next fifty-sixty years. But eminent scholar and writer Anna Khandale, Anna to his friends, doesn’t agree with the general perception. He has, infact, put a new spin on the issue while fielding my question ‘when will Meher Baba manifest’. In his view, Meher Baba’s manifestation is not a one-off affair. “No, His manifestation is not an event, like Krishna allowing Arjun to see His divine universal form on the battle field of Mahabharata. He is continuously manifesting; it has become much more pronounced after He dropped His physical body in 1969”, Khandale, who has been living in Meherabad for over a decade, told me in an interview at his modest one-room unit near the Old Mandali Hall in Lower Meherabad. Khandale came to Baba through the Theosophical movement. He saw Baba for the first time in 1944 in his home town Akola in the backward Vidarbha region of Maharashtra. Baba visited Akola while on Mast tour. Khandale became a regular at Meherabad only after Baba dropped His body. Presently he is one of the two care-takers of the Samadhi shrine. A much sought after speaker and a prolific writer, he is very unassuming and is acknowledged as a walking encyclopedia on Meher Baba. One of his recent books is titled ‘The Mystery of Life and Death’. It draws upon the hidden meanings and purposes of life as revealed by Avatar Meher Baba. “Historically speaking, and going by earlier Avataric advents, the only thing that links the advents is the purpose. Why God has been coming again and again as God Man amidst us? He is coming to re-direct our energies, to re-orient our outlook and to make us realize the Path to reach Him. Each Avatar carried out His Mission according to the needs of the time. Message was the same; Content of the message was the same. The way the Mission was executed was different. In fact, there was no Krishna -like vision gift to Arjun every time. I agree in every Avataric advent, the God Man helped many Arjuns to know Him but it was not necessarily in the way Mahabharata’s Arjun saw Him. As Khandale paused as if ready to take a question, I asked him, ‘Did not Meher Baba say He is the last Avatar in this present cycle?’ As Anna was gently nodding his head, his wife Usha (they celebrated their 54th marriage day on Jan 24, 2012) quietly entered the room, placed two cups of steaming tea before us and left us undisturbed. I don’t think he took notice of her entry and exit, much less of the tea cup before him. I had to remind him, though he was my host, of the tea that was getting cold in the cold breeze that had engulfed Meherabad that December evening. Said Khandale, “It was some time in the December of 1942 that Baba told the Women Mandali that He is the last Avatar in this present cycle of twenty-four. Therefore, the present Avatar is the greatest and the most powerful. Baba told the women Mandali probably in the same conversation that he has the attributes of five Avatars – as pure as Zoroaster, as truthful as Ram, as mischievous as Krishna, as gentle as Jesus, and as fiery as Muhammad. We are lucky in a way that we all came to know of Him when He was in our midst physically”. I hastened to correct him. “Don’t say we. Say I, it is ok because you saw Him in 1944 itself. I only heard of Baba in the late sixties by when He went into His seclusion and offered no public darshan. I wrote a couple of letters. Eruch and Adi replied on His behalf. Bad luck, I lost those letters over the years. I saw Baba only when He moved into the Samadhi and gave His darshan for seven days”. Anna said: “When you had darshan or whether you could have His darshan is not material. You should not go by that benchmark. You heard about Him when He was physically amidst us, when He was physically suffering for us. You were able to come to Meherabad for His great darshan. All this is no mean thing. How many of our contemporaries have had this much opportunity. When compared to many, we are lucky, you are lucky and you and I are lucky because He provided the opportunity to hear about Him. Unless God wills–He doesn’t will always — we cannot come anywhere near the place which He makes His abode. “Read Bhauji’s (Bhau Kalchuri) book on Baba Manifesting. He clearly brings out the majesty of the Avatar and the great significance of the Manifestation of Meher Baba. According to Bhauji, being the last Avatar of this cycle, Meher Baba Mission is to bring all the religions, sects, cults and isms together, and He accomplishes this by breaking down each of the religious orthodoxies. “Now why Meher Baba is the greatest of the Avatars of this cycle? Baba is the greatest because, as Bhau says, Baba is for all races of humanity. His universal work is the culmination of all the work of all previous Avatars. His work will benefit the world more than any of the previous Avatars. The people of each religion of the world will recognize Him as the same Ancient One, who appeared in the form of Zarathustra, Ram, Krishna, Buddha, Jesus and Mohammed. “Yes, Meher Baba is different from the earlier Avatars. He did not speak. He observed silence for days and months and years. Yet, His silence was eloquent. I think His silence spoke more words. Unlike in the earlier Avataric times, Meher Baba traveled extensively around India and the world. Bhauji’s Lord Meher tells us what He said and what He did on every single day of His Mission on earth. Lord Meher is not a book; it is a mirror to every day life of Meher Baba. Such chronicles are not there about earlier avatars. So, Lord Meher is a path breaking effort; it tells you what Meher Baba did on any given day, with whom He had interacted, what message or discourse He gave. I interrupted Anna Khandale again. “You have not answered my main question”. He replied: “I am coming to that point. When God is amongst us, the universal tendency is to see His physical presence as an ordinary man of the world. When He asserts His Divinity on earth by proclaiming Himself as the Avatar of the Age, He is worshipped by some who accept Him as God, and glorified by a few who know Him as God on earth. These are few lucky souls who had come in contact with Him because of their carry forward sanskaras. Rest of the humanity doesn’t recognize Him, instead condemns Him, makes fun of Him, when He is physically in their midst. Frankly, such condemnation or attacks make no difference to Him. Going by what we have seen in Meher Baba’s life, we can say even such condemnation is a part of Divine Theme and Plan. How will you know about Him unless there is someone who speaks about Him one way or the other? “Take Prabhu (Lord) Ram, for instance. He was known and respected by the people of Ayodhya and beyond as a King, and not as Incarnation of God. It took thousands of years for the mankind to accept Ram as Avatar of the Age. Today we see there are lot of devotes of Prabhu Ram; there is no need to tell them that Prabhu Ram was the Avatar – God in Human form, that he had taken birth to end evil and to re-establish truth and to awaken sections of humanity towards divine love. God manifests Himself in the hearts of humanity but it takes some time. “Prabhu Ram did not establish a religion, certainly a religion as a prison, such things are always later day creations and it is to break the barriers created by religion in action that God Man comes down to the earth to end all orthodoxies and to let fresh breeze in again. “We are on the point that Avatar is seldom recognized during his Physical Life time. At the time of Lord Krishna, even Arjun, who was so close to Him, did not accept Him as God in Human form, and, therefore, Lord Krishna had to give him Virat Roop Darshan (Divine Universal Form). It took thousands of years for the mankind to accept Krishna as God in Human form. So we can say it takes years and years for the Avatar to manifest Himself in the hearts of humanity. The same thing happened when Jesus Christ arrived, during the time of Gautam Buddha and the time of Prophet Mohammed. But the case of Avatar Meher Baba is quite different. He declared Himself ‘I am the Avatar of the Age’. And said: The time has come. I repeat the call, and bid all COME UNTO ME’. “Meher Baba said: ‘I veil myself from man by his own curtain of ignorance and manifest My glory to a few. My present Avataric Form is the last incarnation of this Cycle of time. Hence My manifestation will be the greatest’. “Let me get into some specifics. In 1938, Meher Baba declared that the world will become ‘instant’. At that time the meaning of the word ‘instant’ was not clear to those who heard him say so. But today we see how Instant has become Instant, how the communication flows between continents, between people, how the world has come together with the Internet. You can move anything from anywhere by clicking on the mouse button. “In the long history of mankind, the history of twentieth century is the most outstanding; it is full of unprecedented events. In this century, we have seen the rise and rise and fall of Communist philosophy, we have seen imperialism at its best and worst and finally we saw its defeat, we have seen the end of monarchies which we know existed in one form or the other from pre-historic period, we have seen an end to discrimination based on race and color of skin, we have seen in India the abolition of untouchability. Read Lord Meher to know first hand how Baba worked to end untouchability in the twenties when untouchability was not a political issue it was to become in later years. “Technological and scientific developments have reached their zenith in our age. Now man is enjoying the privileges of yogis enjoyed –with his cell phone, television, and computer. This is all because of the advent of God in human form as Avatar on earth. The scientific inventions are at their zenith on account of the migration and influx of highly brainy men from other planets — with 100% intellect to our earth. It is all due to the Advent of Avatar, as Meher Baba says. “Meher Baba bathed the lepers who were suffering from wet leprosy with His own hands. No Mahatma or saint of the world has done such work so far as wet lepers are concerned. 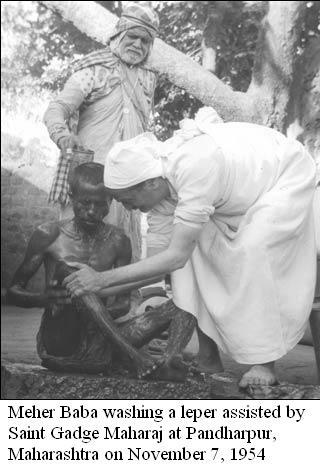 Baba worked with lepers in an age when anyone afflicted with leprosy was made a social outcaste. This incurable disease of leprosy has become curable in this age because of Avatar’s invisible work. “All the age old traditions and practices in political and social systems are becoming a thing of the past one after the other in this age to our surprise. It is all because of Avatar Meher Baba’s invisible work done…He did all His work incognito. He did not have a PR agency to tell the world what He was doing or what he had set about to do. Well, He needed none. This creation is His. He is here to set right things and give a universal push. “Though His work carried out beyond the gaze the media, Meher Baba is today visible than ever before…. His biography running into 6000 plus pages is on the Internet for everyone to read. Shall I tell you more bluntly? Meher Baba is today available to the humanity through innumerable channels, on the Internet, and YouTube at the click on the mouse. Contrast this phenomenon with the times of Prabhu Ram or Lord Krishna or Jesus – None of these past Avatars were easily available to the people of their times excepting a chosen few, who were very advanced souls. “Now, you can understand why I keep saying Avatar Meher Baba has started manifesting, and is waking up people. Come and spend a day at the Samadhi. You will see people coming for darshan from all walks of life from all over the world, White Man and Woman, Brown Man and Woman, Black Man and Woman – people of all ages, of all castes, creeds and religions from China, Russia, Africa, Latin America and so many other regions. “…I met this couple – who are Theosophists – they came to Samadhi one day evening, not knowing whether the doors would be open, wondering what would be the practices here at the Samadhi. They told me that they had come here because Baba appeared in their dream and asked them ‘Why are you not visiting my Samadhi’. That was the first time they had heard about Meher Baba. “Do you know what had prompted the construction of the beautiful Baba centre in Delhi? The inspiration came from a non-baba lover family; their son on the death bed spoke of Meher Baba and told them that he was seeing Baba. After the son died, they made enquiries about Meher Baba and learnt about Baba from friends in Delhi, Mumbai and other places and came here to the Samadhi. What does this all tell you? Anna looked at me as if he was waiting for my response. But what could I say, add or subtract to what he has said about the One, who has grandly declared that ‘all religions and traditions belong to me’, and that His advent is ‘for all, not those of East or West, or any other arbitrary distinction based on accidents of birth, geography and the like’. Meherabad itself bears true testimony to the unfolding phenomenon. Over the past forty years, this dry, draughty sleepy village has become a township pulsating with activity; a place, which once had no shelter for overnight stay, today offers comfortable accommodation through out the year, and the throngs of visitors have made every day an Amartithi. This entry was posted in Meher Baba Speaks, News and tagged Avatar, Avataric Legacy, God Speaks, Meher Baba, Meherabad. Bookmark the permalink.